CLUVER -Daciarum Moesiarum que, Vetus Descriptio. CLUVER,P. - Daciarum Moesiarum que, Vetus Descriptio. Daciarum Moesiarum que, Vetus Descriptio. - CLUVER,P. Title : Daciarum Moesiarum que, Vetus Descriptio. . Size : 5.7 x 7.5 inches. / 14.5 x 19.0 cm. 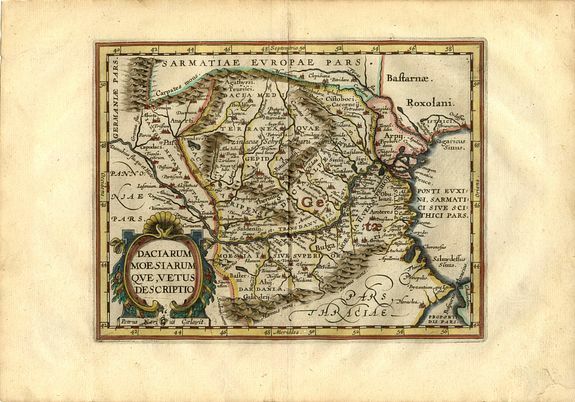 Description :Handsome small map of the ancient region of Romania and Bulgaria based on Ortelius' map of the same title. Filled with old place names and embellished with a fine title cartouche. Condition : Good, there are only 2 small wormholes at the underborder.